This Week 7 game between Livonia and Breaux Bridge may not have been the biggest matchup that I have been to all season long on paper, but it proved to be the most exciting. 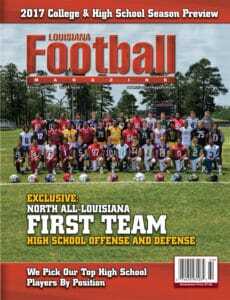 Entering this game, both the Tigers of Breaux Bridge and the Wildcats of Livonia have had their problems over the course of the season. Heading into this game, the visiting Breaux Bridge Tigers are having a decent start to the season with a 3-3 record under second year Breaux Bridge Head Coach Terry Martin. Earlier that day, Martin told me that the team has been hit with the injury bug and unfortunate situations as four of their five offensive linemen are banged up with injury and two of their star sophomore players in explosive WR Dartrevien Girod and LB Tyrese Martin, who both started as freshmen, would be unavailable for this game. As for the Livonia Wildcats under first year Head Coach Marc Brown, it has been a rough first couple of games as the team is 1-5 heading to Friday’s game. The surprising slow start to the season has to deal with the youth and inexperience that this team has. According to Coach Brown, the team has played 18 of the possible 22 starters that have not played significant playing time for the Wildcats last season. It also hurts when you lose bigtime players like Patrick Queen (LSU) and others. Injury problems and inexperience may have hurt both teams, but the game did not show it later on that night in “the Jungle” at Wildcat Stadium. Even though the Wildcats are very inexperienced at the majority of the positions, they are set at arguably the most important position, which is quarterback, and boy did it pay dividends early in the game with junior quarterback Kerri Wells, who had multiple starting seasons under his belt. Early on, it was all Livonia as they looked like the team was going to run away with this game early on with a 14-0 lead in the first quarter. The short passing game was clicking early on and Wells was making good decisions throwing to the talented young skill players that the Wildcats have. On the following possession in the second quarter, the Wildcats scored once again on a Mac Shaw nine yard touchdown run to make it 20-0. Coach Brown and the Wildcats decided to go for the two point conversion to make it 22-0 in which they converted. Just when it seems like Livonia was going to name their score and run away from this game, everything begins to change. 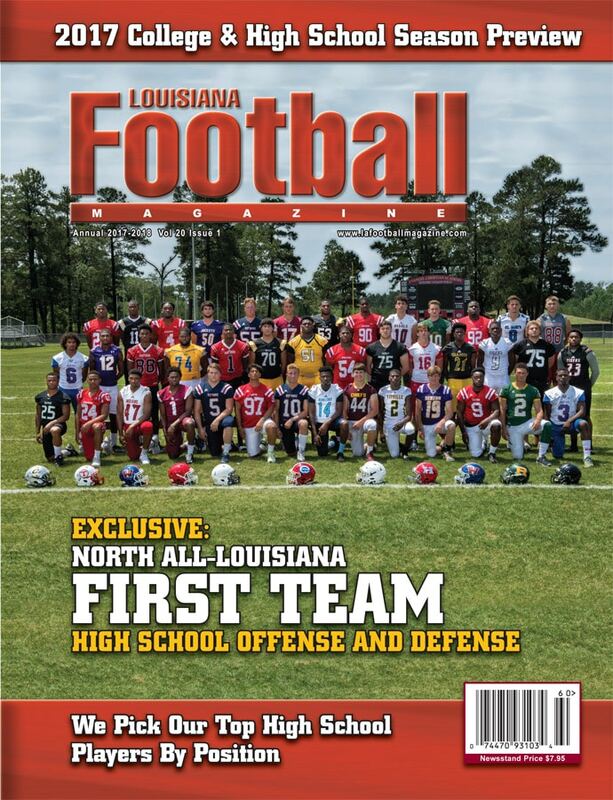 The Livonia defense commits three penalties in a row to give the Breaux Bridge offense extra yards to work with. A couple of plays later, Breaux Bridge junior QB Cole Mouton throws a jump ball to senior WR Terry Steward Jr. for a 15 yard touchdown to make it a two possession game at 22-7 with the ensuing extra point. After a stalled drive by Livonia, Breaux Bridge builds off their momentum from the last touchdown drive with a big play from Mouton to speedy sophomore running back Kavion Martin for 54 yards. That play set up a six yard touchdown by Martin to finish off the drive. The extra point made it an one possession game at 22-14. However, the Wildcats get a big return from Shaw on the ensuing kickoff to set up the Wildcats in good field position inside the twenty yard line. After three plays, Brown called a time out with four seconds left until halftime to run one more play. This would be a big play in the game as the Wildcats try to extend the lead with a touchdown while the Tigers would carry a lot of momentum into the half. Wells scrambled around looking for a wide receiver, but it was covered beautifully by the Tigers defense as the ball was deflected ending the half. The Livonia coaching staff was not happy with the call by the referees as they thought that there was indeed holding in the end zone, but the call stood giving the Tigers a big time stop and huge momentum trailing the Wildcats 22-14. The Tigers carried that momentum in the second half really dominating the third quarter. The Tigers started with the football and went down the field on a ten play 56 yard drive, which was capped off by another Martin touchdown run to make it 22-20. Martin decided that the offense should go for two points to tie the game and the two point conversion was indeed good tying the game at 22. The scoring would not stop for the Tigers as the defense got a turnover on downs. The Tiger running game got going with six yards a run on every play and the offense set themselves up inside the five yard line as the third quarter came to a close. 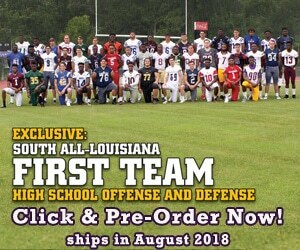 In the fourth quarter, the other running back Logan Bossier, who is the bruising runner of the two, ran for a five yard touchdown to get the team their first lead of the football game at 29-22. It was an amazing turn of events as the Breaux Bridge Tigers scored 29 unanswered points, but the Wildcats did not give up as the offense went on a long drive of their own with a 12 play drive. The drive resulted in a Kerri Wells three yard touchdown run to make it 29-28 with just under two minutes left to play. For Coach Brown, it was decision time. Do you kick the extra point and try to see if the team can get it to overtime or does the team go for two to take the lead and hope that the defense gets a stop. Well, Coach Brown chooses the second option and shows some real trust in his young team. 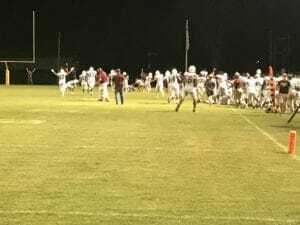 His offense responses as the Wildcats do indeed get the two point conversion to put the team up ahead, but the problem was there was still some time left on the clock for Breaux Bridge to go down the field and kick the game winning field goal. The Wildcats had a chance to win the game as the Tigers had a fourth and three, but Bossier picked up a tough seven yards to continue the drive. On the next couple of plays, Mouton made some quick short throws to seniors Nick Cornes and Steward. A quick slant from Mouton and Steward set up a field goal attempt with four seconds left to play. After a clutch drive by the junior quarterback, he had to go out there as the placekicker with a chance to win the game for the Tigers. As expected, the Wildcats called a timeout to ice the kicker. After the timeout, the game came down to the leg of Mouton. The snap was good. 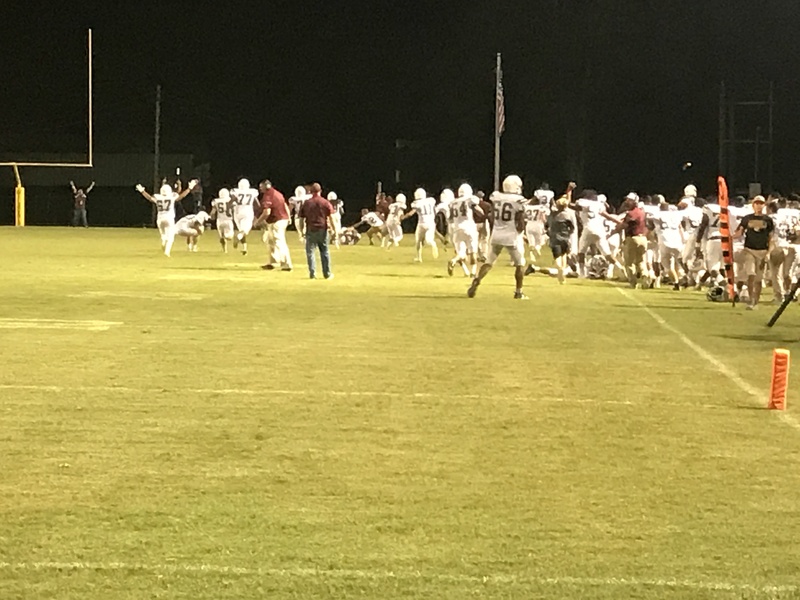 The hold was good and the kick was hit dead center between the uprights to give the Breaux Bridge Tigers a very emotional 32-30 victory over Livonia. For Breaux Bridge, it was a hard fought victory for the Tigers, who just never gave up in the game after the very slow start. The Tigers dominated the second half, and it proved to be vital in this classic game. It was a very important victory for the Tigers that they were able to come back in the game when things were not going their way and doing it on the road with a banged up team. This type of game will help the Tigers later on in the playoffs, but as of right now, the Tigers will improve to 4-3. As for the Wildcats, it was just the opposite as it is as tough a loss a team can have. Coach Brown told me that this was a game that the team needed to get and it looked like they were going to get that early on in the game, but penalties and mistakes have cost the Wildcats in the end, who fall to 1-6. 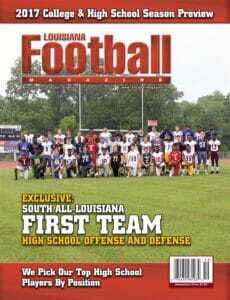 For the Breaux Bridge Tigers, they will face Terry Martin’s former team in the 3-4 Cecilia Bulldogs. For the Livonia Wildcats, they will face the 4-3 Beau Chene Gators. 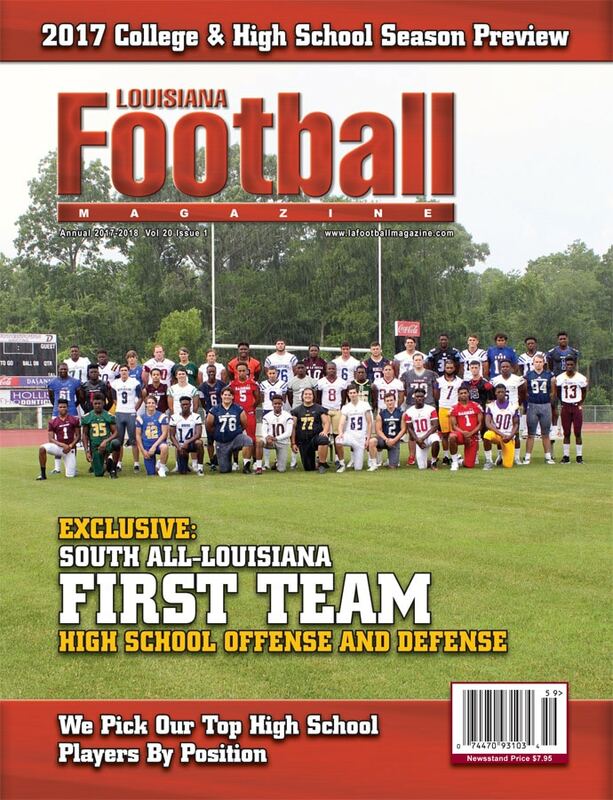 For more game recaps the rest of the season, make sure to check out our website at www.lafootballmagazine.com!